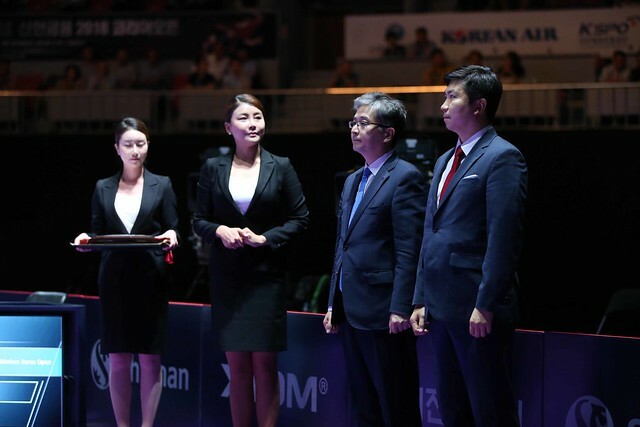 The first titles to be decided at the Seamaster 2018 ITTF World Tour Platinum Shinhan Korea Open; on Wednesday 18th July, DPR Korea’s Ham Yu Song and Japan’s Miyuu Kihara emerged as the respective Under 21 Men’s Singles and Under 21 Women’s Singles champions. It was for both their first ever such success at a recognised open international tournament and for each a quite remarkable achievement. Miyuu Kihara is only 13 years old; she will still be eligible for the event in 2025 and although she still has some distance to go, could she eventually overtake colleague Kasumi Ishikawa? She is the most successful player ever in Under 21 Women’s Singles events on the ITTF World Tour; between January 2010 and December 2012 she collected no less than ten titles. Overall it is the 75th time that Japan has won an ITTF World Tour Under 21 Women’s Singles title; Miyuu Kihara being the 26th player from the Land of the Rising Sun to achieve the feat. Furthermore, it is the eighth time that Japan has claimed the title in the Korea Republic. Reiko Hiura won in 2003, the following year Ai Fukuhara succeeded. Later in 2012 Kasumi Ishikawa emerged victorious, before in 2014 Hitomi Sato donned the crown. More recently Yui Hamamoto won in both 2015 and 2016, whilst last year Minami Ando secured the top prize. In Daejeon, at the semi-final stage, Miyuu Kato, the no.3 seed, beat colleague, Miyu Nagasaki, the no.2 seed (11-9, 11-6, 1-11, 8-11, 11-9), before in an equally close final, accounting for Hong Kong’s Minnie Soo Wai Yam, the top seed (3-11, 11-2, 12-10, 10-12, 11-9). In the counterpart semi-final, Minnie Soo Wai Yam had overcome India’s Ayhika Mukherjee, the no.14 seed, in yet another contest decided by the minimal margin (5-11, 11-6, 8-11, 11-6, 13-11). Remarkable for Miyuu Kihara, who had appeared last year in the final in Tokyo when losing to Yuka Umemura, because of her age; remarkable from Ham Yu Song in the fact that he started the event as the lowest rated player. Moreover, he was the only non-Japanese player to reach the quarter-finals! In the penultimate round he beat Kakeru Sone, the no.21 seed (12-10, 5-11, 10-12, 11-7, 11-6), prior to securing the title at the final expense of Kohei Sambe, the no.14 seed (11-9, 10-12, 11-6, 11-7), a player very much in form. At the semi-final stage he had beaten Mizuko Oikawa, the no.2 seed (11-9, 10-12, 11-6, 11-7). 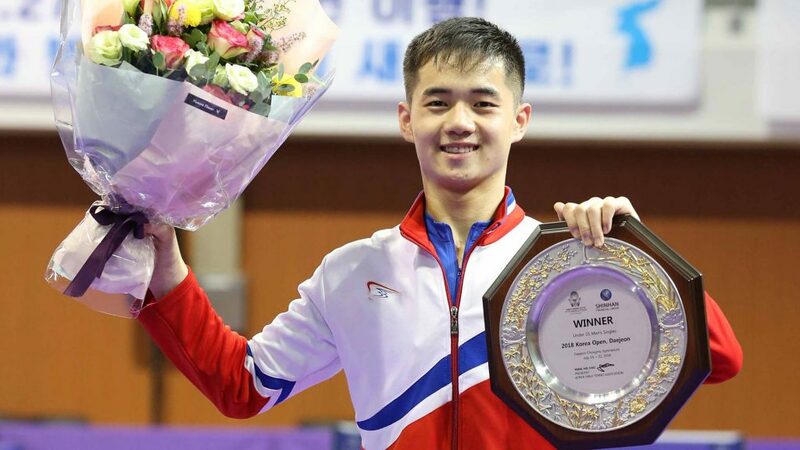 Success for Ham Yu Song means that it is the fifth time a player from DPR Korea has won an ITTF World Tour Under 21 Men’s Singles; moreover, he is the fifth player. In 2002 O Su Yung won in Qatar, in the same year Ryo Hyon Sop succeeded in China; more recently, in Pyongyang, Pak Un Hyok clinched gold in 2015, Ro Hyon Song prevailed the following year. Now can Ham Yu Song build on the success, he is only 19 years old and has two years left in the age group; also is there a good omen for his future? He shares the same birthday as other notable names in the sport, Austria’s Liu Jia, Sweden’s Truls Moregard and a certain Chinese star, Zhang Jike.